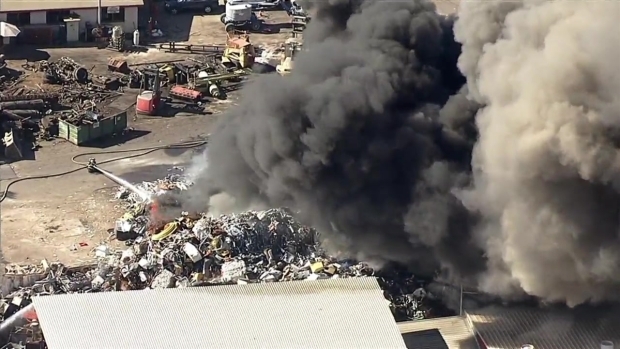 A two-alarm fire burned through a metal recycling yard in San Leandro, near Oakland International Airport on Tuesday. The fire at ALCO Metals started about 5 p.m. and sent black smoke billowing into the air that could be seen for miles. It was burning at Davis Street and Doolittle Drive, fire officials said. The fire was under control by about 7 p.m., fire officials said. Witness Tommy Pirkington said he could actually see the fire spreading up the pile of scrap metal. A two-alarm fire was burning at a metal recycling yard near Oakland International Airport on Tuesday. Cheryl Hurd reports. “It spread pretty quickly; you could hear things exploding in the back," he said. Fire officials issued a temporary shelter-in-place order for nearby residents. Those living west of Interstate 880 between Davis Street and Fairway Drive were advised to remain indoors and close all windows. Drivers were asked to avoid the area. The shelter-in-place order was lifted just after 10 p.m. The Alameda County Fire Department was the lead agency, with assistance from the Oakland Fire Department. Lisa Fasano, spokeswoman for the Bay Area Air Quality Management District, advised people downwind of the smoke to close windows and doors, and if they have air conditioning units to put them on recirculate. Anyone having difficulty breathing should try to get upwind of the smoke and people with respiratory or impaired conditions should seek medical attention if needed, the air district said. Firefighters from multiple agencies in the East Bay try to surround a large fire in a metal recycling yard near Oakland International Airport.